Home health care and home nursing programs are an excellent way to provide care and restore an excellent quality of life for your senior family members. When it's time to bring your loved one home from the hospital or rehab facility, let p.r.n. Home Health Agency handle their day-to-day medical and non-medical care. Our staff has over 35 years of experience providing senior care, and our diverse team is well-equipped to help your elderly family members maintain independence while getting back on their feet. 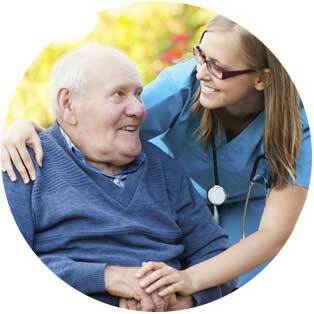 Our home health services are performed by skilled and licensed professionals. Our staff of home care providers are prepared to handle all your loved one's care needs. Skilled in-home nurses provide a variety of services – including disease management, post-surgical care, and wound care. Our experienced case managers will coordinate and guide each patient's overall plan of home health care. Our licensed physical therapists are experienced in helping patients recover from fall injuries, joint replacement surgeries, and stroke-related disabilities. Physical therapy services assist the patient in learning how to restore function by training on gait, use of cane, walker, wheelchair, artificial limb, energy conservation, and return to work status. Occupational therapists assist the patient in learning how to perform daily living skills - such as bathing, grooming, dressing, and toileting - to help them return to their prior level of independence and mobility. We also conduct a fall risk assessment at the patient's home and make recommendations to improve patient safety. Speech therapy services assist the patient in restoring language and communication skills to improve quality of life. Medical social workers consult with the patient regarding financial, social, and/or transportation problems. They also help establish long-term plans as well as aid with crisis intervention and counseling. In conjunction with skilled in-home nursing services, Certified Home Health Aides provide assistance with bathing, dressing, meal preparation, and household tasks on a temporary basis. Our home health care services are licensed by the Department of health and certified by Medicare. Services are covered post hospital by Medicare, Medicaid and most commercial insurances on an intermittent basis.